“Ribbit” tells the tale of a frog named Ribbit with an identity crisis. Unlike other frogs, Ribbit hates hopping and has a strong aversion to water. Feeling a misfit, he is full of questions about his life. Together with his best friend, a flying squirrel, he embarks on a soul-searching journey in search of the truth and his rightful place in this world. Confusion reigns when Ribbit accidently hypnotized by a conman or rather, a ‘conbat’, making Ribbit believe that he is a human prince trapped in a frog’s body. 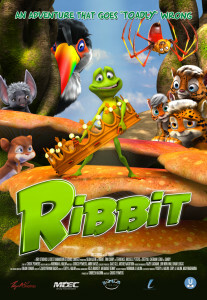 With a mission to kiss a human princess, Ribbit will soon discover that being a frog is not bad after all and the love of his life has always been right before his very eyes.